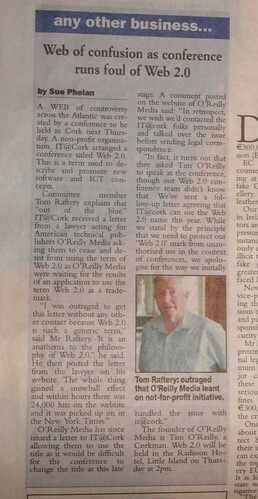 This is an article which was run in yesterday’s Irish Examiner (Friday June 2nd 2006) in the wake of the controversy surrounding CMP/O’Reilly’s trade marking of the term Web 2.0. The picture of me included in the article shows just how much the stress of the last couple of weeks has aged me. I can see now, as I am growing older, that I’m starting to look more and more like my father. Hang on a sec, that is a photo of my father! It seems that, despite my supplying a photo by email for the Examiner and despite spending around 20 minutes posing for photos with one of their staff photographers (laptop on your left shoulder, ok now try on your right…), they still managed to use the wrong photo! Ironically some of the comments during the Web 2.0 debate lamented the fact that bloggers weren’t taking the trouble to be as accurate as main stream media! Hmmm. “Web of controversy”, do you see what they did there aren’t they clever. Honest to god, where do they get their journalists, primary skool? The whole WEB 2.0 is getting old. Maybe it’s time to patent WEB 2.5 or WEB 3.0 or WEB x.~ ? Jokers. But you’re better off if it was going to be one of those horribly cliched man-with-a-laptop shots! going on recent experience, I think I need to email them before sueing them, or something! My goodness. How must Tim look? Living now for some time in Madrid … God I miss the The Examiner. Not just for the mix up with the photo but for the “Tim O’Reilly, a Corkman”. When did he leave … age 1 or something??? Well done on blogging the letter … I am surprised and disappointed at the reaction of both Tim and Cory. But pleased that you have stood your ground and vehemently so! Funny, how did they end up with a picture of your father though that is what I don’t understand. After some further reading on the topic apparently 2.5 or 3.0 or anything like that can’t be used either as the copywrite extends to 10 numbers away from the actual specific copyrighted one, that what I read anyhow. The subeditor who marks up the galley space details the photo requirements for a gofer who normally uses a hit that surfaces when quering the Examiner photo archive. If your dad shares your name, his image will subordinate yours on a simple search. Your shots didn’t hit the archive at galley time–happens a lot with Irish papers–and the print run shows dad instead of son. On the positive side you do look more distinguised. How did they get hold of your father’s picture? I just read about your dispute with Tim O’ Reilly. Itr is really despicable of them. I suggest we ditch the term “Web 2.0” altogether.